Acura of Limerick is the trusted Acura car dealership near King of Prussia, PA and your premier destination for the best selection of new Acura vehicles in town! We’re so excited to have the continued privilege of serving our community with these great vehicles and we’re highlighting one of the newest arrivals to the fleet – the brilliant 2018 Acura RDX. This is a must-see SUV that we think you’re going to love! 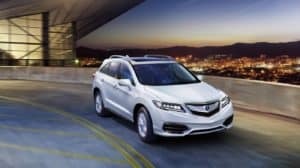 The 2018 Acura RDX is yet another fabulous offering from the Acura brand, and this SUV is a beautiful combination of engineering and design that creates a truly remarkable driving experience. The featured 3.5-liter V-6 engine is is capable of producing 279 horsepower, while the six-speed automatic transmission is efficient in supply the power to the featured front-wheel drivetrain. All of the discussed performance is augmented by the classy good looks that the 2018 Acura RDX has on offer. The exterior body design includes clearcoat paint, 18-inch wheels, deep tinted glass, and chrome side windows trim to give off an aesthetic of quality craftsmanship. Picking the right SUV (especially for a family vehicle) requires careful consideration. You want to find one that is as safe as can be while also being very comfortable and enjoyable. In the 2018 Acura RDX, you have an SUV that ticks all the boxes in a big way. Safety is addressed as a top priority and it’s clear to see with features like a back-up camera, side impact beams, ABS brakes, and much more. You’ll be driving with priceless confidence and assurance. Keeping everyone entertained in the 2018 Acura RDX is a breeze thanks to a bevy of key amenities. Some of our favorites available to you include a premium 7-speaker sound system, SMS text message function, Bluetooth® wireless, and leatherette seating with heated front sport bucket seats. Everybody you know is going to want a turn riding in the 2018 Acura RDX! Acura of Limerick is conveniently located at 77 Autopark Blvd in Limerick, PA and we invite you to visit us. We’d love to get you properly acquainted with the 2018 Acura RDX, or let you browse our Acura showroom with other impressive models. We hope to serve you soon!